Amy Smart/Jasmine Hollander first appeared in “Daddy’s Girls”. By the time Season 2 rolled around Jasmine and Fiona had become quite chummy. So much so she repeatedly tried to set Fiona up with older “friends”. We soon discovered Jasmine was interested in more than friendship and was upset Fiona did not return her feelings. Unfortunately, Jasmine soon began to spiral and shortly after disappeared from Fiona’s life and the show. Taylor Kinney/Craig Heisner Every girl, and guy for that matter, has that one person from school that made the days seem a little brighter. For Fiona, that person was Craig Heisner. Fiona also learned what many of us have and that it sometimes a fantasy is better left as a fantasy. Especially when that fantasy turns out to be a bad lay in the back of a dirty van. Regina King/Gail Johnson made her first appearance in “Hope Springs Paternal” as Fiona’s no nonsense probabtion officer and by the time she made her final appearance of the season in “Lazarus” fans were clamoring for her return in Season 5. There’s been no word as of yet regarding her return, but when/if she does come back we will be waiting with open arms. 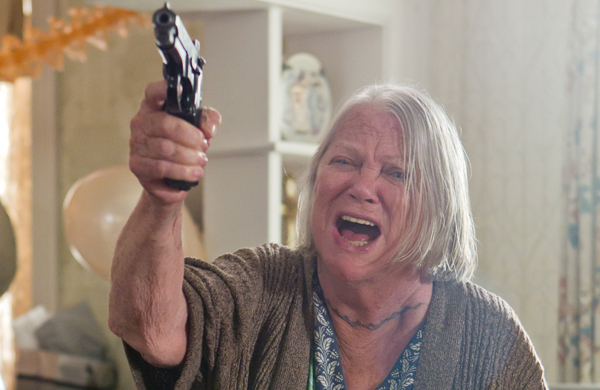 Louise Fletcher/Peg Gallagher Before Frank’s mother came on the scene we thought we had Frank pretty much figured out. We should have known we hadn’t even begun to scratch the surface. If Peg had been played by any other actress the chances were we would have hated her on sight, but with Lousie Fletcher in the wheel house what we got was a woman who could be a hateful, abusive human being one minute and a semi-loving grandmother the next. Jeffrey Dean Morgan appeared in all of 2 scenes during the Season 4 finale and it was just long enough for us to see “Will Jeffrey Dean Morgan be in the fifth season?” inquiries whenever a casting update is announced. Can you just imagine, if he does return, what he could do with, say, 3 scenes? Blows. Our. Mind.